Welcome to Mattes Family & Sports Chiropractic! 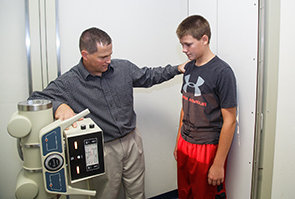 Established in 1999 by Dr. Steven J. Mattes, Mattes Family & Sports Chiropractic provides patients in Newton, Iowa, and surrounding communities with personal and thoughtful chiropractic care. Experienced in treating sport injuries as well as pain to the back, neck, head and extremities, Dr. Mattes and his staff listen to their patients concerns and will make every effort to eliminate their pain. Dr. Mattes utilizes chiropractic manipulation, x-rays, ultrasounds as well as a variety of therapies and exercises to discover the source of the pain and administer a solution. Additionally, our dedicated staff presents patients with a pleasant environment and will take care of any insurance filing, concerns and questions. Call Mattes Family & Sports Chiropractic today at (641) 787-0311 to become one step closer to living a pain-free life! Mattes Family & Sports Chiropractic provides patients in Newton, Iowa, and surrounding communities with personal and thoughtful chiropractic care. Dr. Mattes utilizes chiropractic manipulation, x-rays, ultrasounds as well as a variety of therapies and exercises to discover the source of the pain and administer a solution. Contact Mattes Family & Sports Chiropractic today at (641) 787-0311.